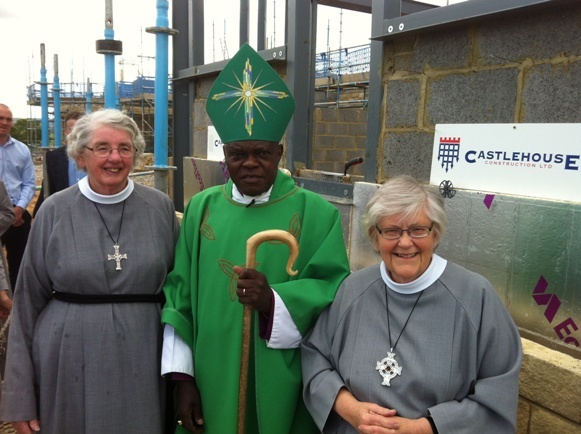 The Archbishop of York, Dr John Sentamu, officially laid the foundation stone for a new Priory today to be built in the grounds of Sneaton Castle, Whitby for an Order of Anglican Sisters. Leeds-based Castlehouse Construction has been awarded the contract to design and construct the new build facility for the Order of the Holy Paraclete. This will become the new Mother House of the Order by the end of the year. The project will provide private accommodation for the Order, including a new Chapel, infirmary wing and associated external works within its grounds. The Order of the Holy Paraclete, led by the Prioress, Sister Carole, has been a part of the Whitby community since 1915 and its existing Mother House looks across the east cliff where St Hilda founded a monastery in 657. The Project has supported local employment with many Whitby residents working on it and Castlehouse has also sourced material suppliers from the Whitby area to enhance local trade. Tourist trade has also been given a boost with many non-Whitby based operatives making full use of the bed and breakfast accommodation available in the town. The Priory is earmarked for completion in December this year.